YAY! It’s time for the My Favorite Things December product launch! All new products are available right now on the MFT onlinestore and the MFT design team, as well as special guests, are sharing projects created with the new stuff. You can find a lot of inspiration! I stamped the flowers onto Kraft cardstock using Versamark ink and heat embossed them with white embossing powder. I die cut the Kraft cardstock panel using the Stitched Square STAX Die-namics. I colored only one flower and added glitter using glitter pens. I adhered the panel to a top-folded card base using foam for more dimension. The sentiment is from the Kind Words stamp set. Another gorgeous card, Francine! I love white on Kraft and how you added sparkle to the bloom...so pretty! So beautiful. I’ve not tried glitter markers before but you e inspired me to give it a go. WOW, your flower is amazing. I like how you only colored one, so it would really stand out! So gorgeous!!! Your colored bloom really pops against the neutral colors! Beautiful way to showcase the flower! Looks great on kraft. This is MEMORIZING! I love it! Simply stunning. I love the way you make a single thing stand out. 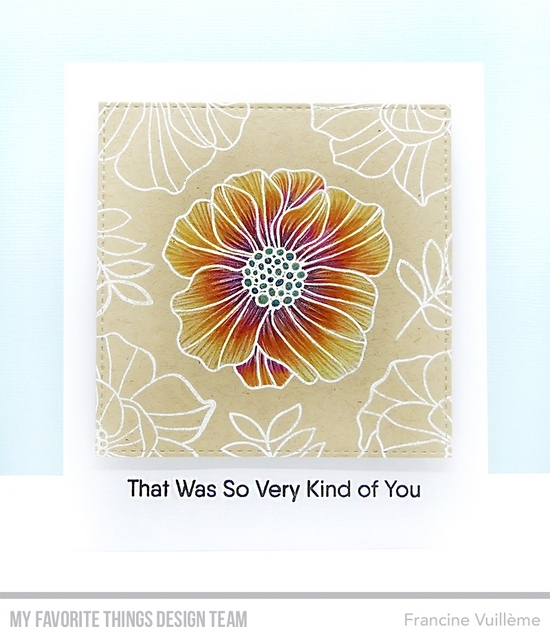 Beautiful card, I like how you isolated the colors to just the center of the one flower. How pretty & I'm so glad you added the sparkle. Wow your coloring is amazing! Wow- your coloring is absolutely stunning! you have a way of making beautiful cards - very nice! Fabulous coloring on that flower, Francine! This stunning card could be used for almost any occasion. I love your card. I am in love with this release! Wow! Beautiful card!!! Great colouring technique!!! Superbe ! J'adore les couleurs. wow the centre flower just pops of the page!!! 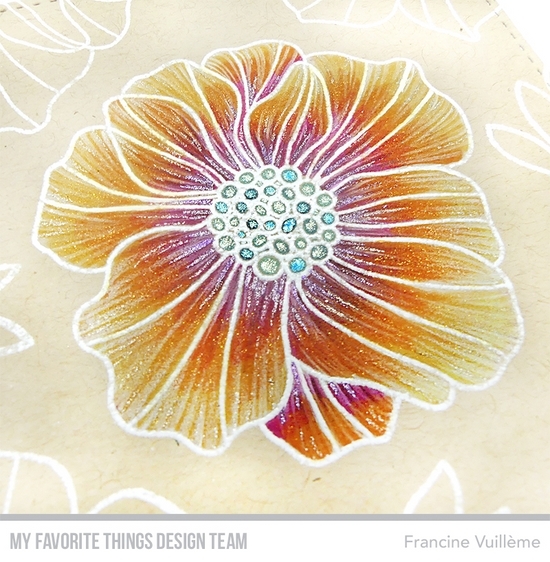 Love the glitter coloring in the flower with heat embossing, it just pops up. Beautiful card! Your colouring is gorgeous! I would love to see the glitter in real life! This stamp is gorgeous! Love the heat embossed flowers on a kraft cardstock. The flowers look awesome with glittery touch. Great colouring. I love kraft cards. Oooooh the embossing really pops the flowers, beautiful. Very pretty. I like how you colored just one flower. Stunning and elegant card! Love your colouring! Wow, so striking! I love the emphasis on the gorgeous central bloom. Fabulous card! Just gorgeous Francine! Your coloring is stunning and I love that just one bloom is in color and it is definitely Brilliant. Thank you for the amazing inspiration for this set.